I know what you're thinking—Puma and Sagem, two brands you're not particularly fond of. Yet, somehow the alchemy is perfect, as Puma has ensured every aspect of the OS and hardware is ultra-styled and feature-led. It's a light device, at 115g in weight, but feature-packed with a solar panel on the back for charging by mother nature's rays. 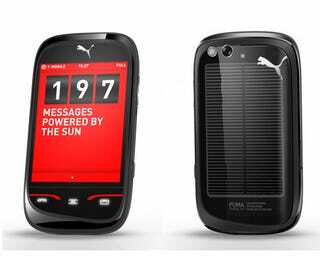 The more you charge by the sun, the more points you collect, which can be spent in the Puma store. You can see how many extra minutes you can talk for, or play music for, or how many extra texts you can send, from charging by the sun. It's little things like this which show how much attention has been paid to all the aspects of the Puma Phone's design. The screen is a 2.8-inch QVGA TFT capacitive panel, with 240 x 320 pixels. Battery life isn't as great as some others on the block, with just a 880 mAh component being used, but the solar panel will more than compensate for that. A 3.2-megapixel camera with LED flash and 6x digital zoom is on the back, with a forward-facing camera for VGA video conferencing on the front. As it's intended for being strapped to your arm, or shoved in your pocket to calculate stats on your training, the compass and A-GPS add strength to the pedometer and GPS tracker functions.